'Could I have a word with you?' This was what our dad would say when he was annoyed or seething, and his children all learned early to interpret those seven words, always spoken quietly and calmly, as incipient doom and looming penalty, which generally meant being sent to your room. Funny how being in your room was refuge and relaxation except when you were confined to it, at which point suddenly it was a beautifully painted prison cell from which you stared longingly into the backyard, where your brothers would be capering and making vulgar gestures and mooning you and savouring every moment of your period of incarceration, in much the same fashion as sparrows taunt a housebound cat; though the cat takes careful notes as to faces, and stores up his resentment on small interior shelves designed just for this purpose. You would be walking briskly through the house, having just committed brotherly battery, and sensibly wishing to get as far from the scene of the incident as possible, and there would be our tall silent dad, sitting in his brown chair by the brown radio, and just as you thought you were clear, and loosed into the hallway to choose among several excellent escape options, you would hear him say could I have a word with you?, and even though he said it so quietly that you would think no one more than a few inches away from him would catch it, you would be thoroughly wrong about that, for his words rang in the air with a clarion shout, and you instantly froze in place, and all brothers within hundreds of yards also froze, thinking for a second that those words had come for them and they were totally and completely screwed. But no, those seven words were for you and you alone, my lad, and you turned slowly and sat down on the brown couch, and dad leaned in gently and said something quietly, and you went to your room for a thousand years. He hit me once, our dad, and I deserved it, having driven drunk in the only car we had. But even then it was a short sharp sudden slap, to wake me up to the depth of his anger and fear, and to the danger in which I had put myself and our family, and dozens of innocents on the road. And he hit our oldest brother once, and by all accounts our oldest brother eminently deserved it. I do not think he ever before or after those incidents struck another of his several children, or roared at us, or even spoke sharply, that I can recall. Somehow, even with all those children, and with the usual brawl and bawl among his sons, and what surely must have been many a snide remark from his daughter, he never lost his temper, or even, that we remember, his equanimity. Just as amazing, he never seemed to miss a crime or misdemeanour, but somehow knew of it instantly, and was there in his brown chair waiting to quietly say could I have a word with you? as soon as your guilty face hove into view. I have roared at my children; I have shouted at them with such vehemence that the veins bulged in my neck and the dog cowered in the corner. I have had the urge to strike a son, but by merciful miracle did not. I have barked at them, and snarled at them, and made cutting and snide remarks to them, and belittled their choices and their opinions, and for all of this I feel a constant silent private simmering shame: that I have not been quite as good a father as I so desperately wanted to be, and might be even yet, given more effort and humility on my part. But I often am glad to realise that I know I have not been the best father I could be because my own father was; and, to his credit and my joy, still is. Brian Doyle is the editor of Portland Magazine at the University of Portland. His most recent book is The Thorny Grace of It, a collection of spiritual essays published by Loyola Press. 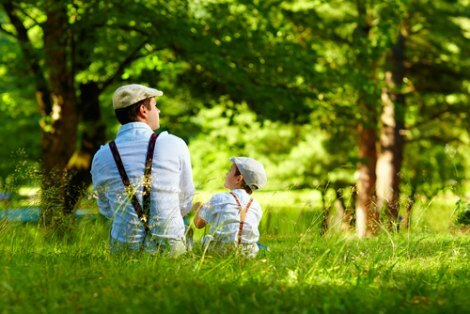 Stock image of father and son via Shutterstock. I too have shouted with such violence that I have reduced my children to instant terror inspired tears and know that self- loathing from having yet once more failed to control my temper.But this beautifully written piece reminded me again of the searing power of example. Thank you Brian. A beautiful distillation of the grace and essence of fatherly love. Should be compulsory reading for the expert child psychologists and parental advisors who plague us all these days. Thank you. For your story. My own father used the belt i did deserve it on occasion. Even now he can reduces me to a defenceless human being and i am 66. He reminds me often of my past sins . Not sure if he realises how hurtful that is or if it a desire to tow the line am a widow have Adult children andhave grandchildren. So why do i feel resentful . Oh Brian, you've done it again. Reduced me to tears in the presence of such love and respect for your Dad. God bless him. God's already blessed you and your siblings! As with her previous films, Kelly Reichardt is interested in people moving through and reacting to their landscape. In Night Moves, the drama comes from the way the characters' reaction to their environment cuts them off from the world around them. This refusal to connect turns toxic.